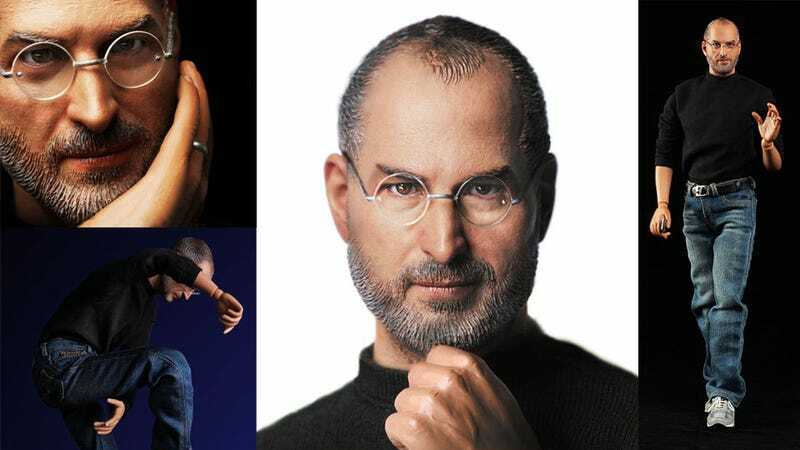 This is not the first Steve Jobs, but it's definitely the most realistic. So realistic that it actually freaks me out. It's 12 inches high (scale 1:6) and comes on full Apple CEO regalia, from the New Balance shoes to the Levi's. If you are a freaky fanboy, you can get it for $100 before the Jobs family send a cease and desist letter to the manufacturers, just like they did with the last one. It also has complements, although not as good as Obama's action figure. This thing can move. Here are two famous images. The iPhone doesn't come with the feature, however. New Balance shoes, Levi's jeans, different hands and a keynote background. I'm sure many fanboys will not use this one, choosing to reenact full product presentations against a backdrop made of an actual Keynote presentation with all the original images, text and effects. I know. It's the forbidden fruit, but you can hide it deep inside your socks drawer and play with it when nobody is watching you, at 3:00am or something. You know you want this as much as I want a 1:1 scale Phil Schiller plush doll.